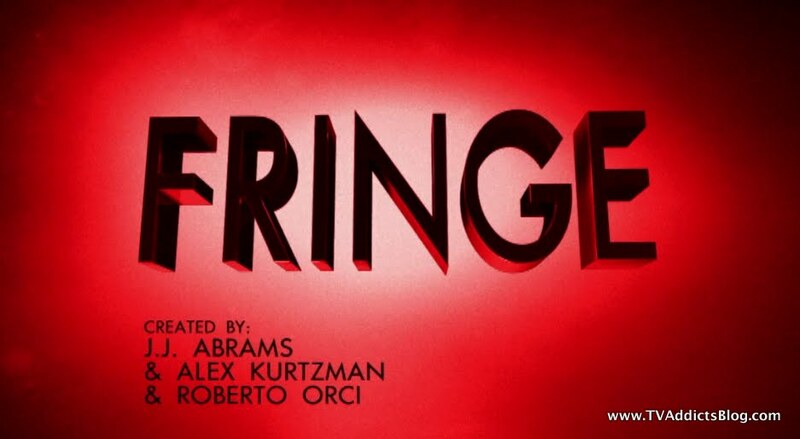 "@JWFRINGE: #Fringewas picked up!! Thanks Fringedom!" There you have it folks, the reason you should all sign up for Twitter. Real-time notifications of the things you care about! Ratings be damned, season 4 is a go! 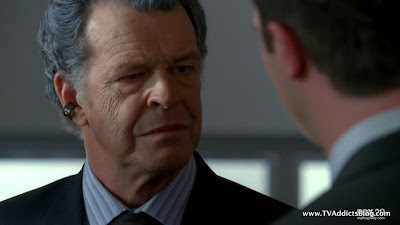 Fox is totally happy with the performance of Fringe on Friday nights and insist that their Friday nights overall have improved because of the show. I'm not sure how much truth there is to that but I do know that they have a fan in Kevin Reilly (Fox Prez) and I don't think he was willing to let the show die. If you want to read an interview with the producers, go right ahead. 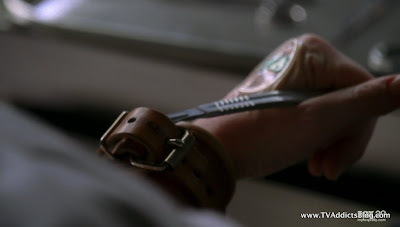 While, I am excited for the season 4 renewal, I am a bit hesitant about the show living much past that. But, let's just call this battle won for now and worry about season 5 next season! If Pinkner and Wyman say they have ideas that could get us to 8 seasons, well then I would like to see what they have in mind! Anyway, let's get to this episode which brought us back OVER THERE. It would seem as this season is drawing to a close that we will be dealing with the show's mythology more than our procedural/mythology inter-fused episodes. This one dealt with Fauxlivia's pregnancy and the potential life threatening issues with it. Of course, things got all FRINGEY and crazy with that pregnancy and we'll get to that. 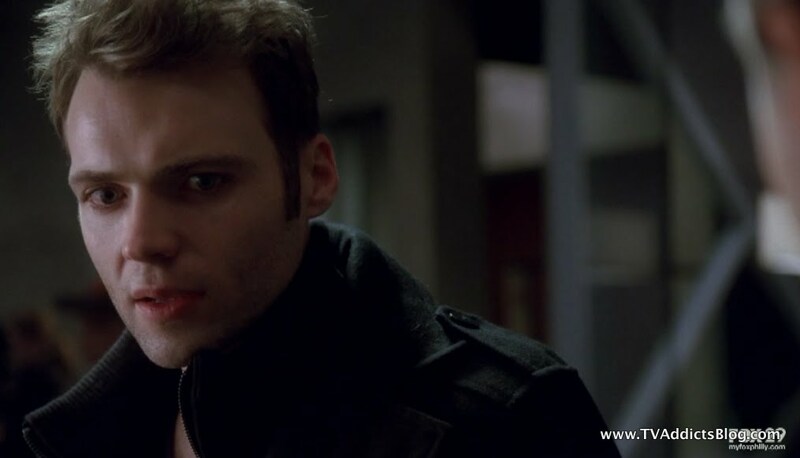 The episode also follows Lincoln and Charlie as they grow more suspicious of the events that have occurred in Alternaville over the past season. (though, they didn't refer to it as a SEASON naturally because they don't realize they're on a television show. DUH!) Lots of stuff to discuss so let's get right on to it! The last time we were with Fauxlivia, she had just found out she was pregnant and she lost her man when she revealed she was in love with the father, Peter Bishop. We started to maybe feel a bit sorry for the poor alternate Olivia. 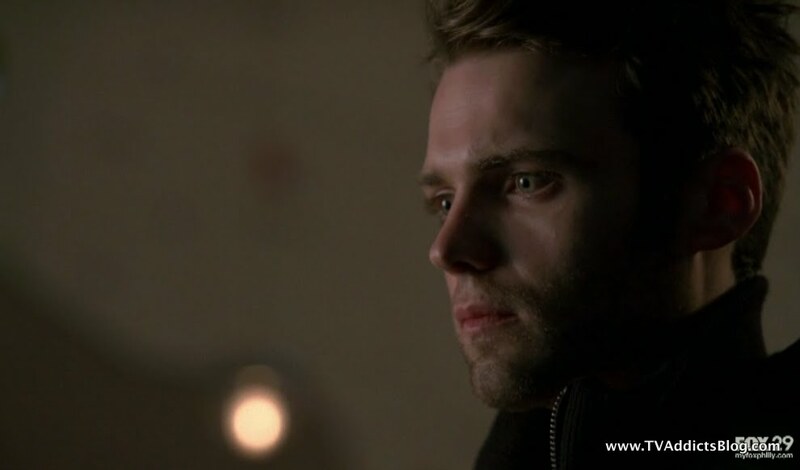 Well, that episode had nothing on this one in terms of getting our sympathy! but let's slow down. 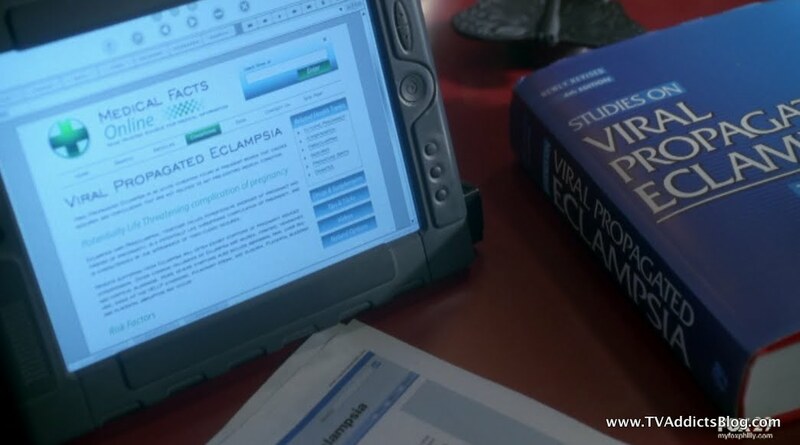 The episode started off with Fauxlivia getting tested for eclampsia (which was referred to in the show as VPE - Viral Propagated Eclampsia). We knew that Altliv's sister died OVER THERE during child birth and apparently she had an 80% chance of having the same issue. Of course, Fauxlivia's mother did not die OVER THERE as she did over here so she was there every step of the way. 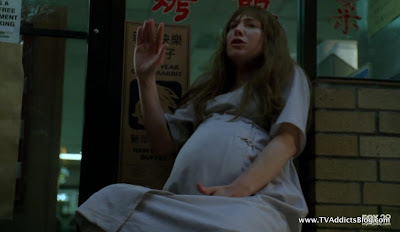 Fauxlivia did not seem too optimistic on her chances of survival with this pregnancy. And, of course, I started thinking "well that would be pretty convenient if they killed her off making Peter's decision a little easier!" 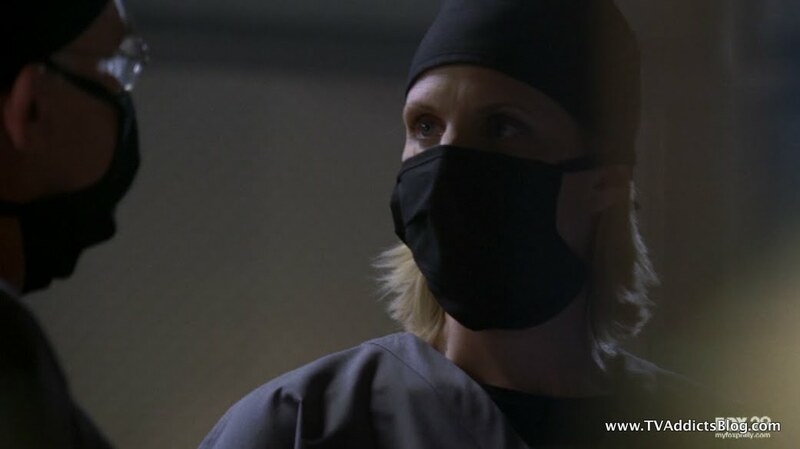 Fauxlivia was questioned by her mother on the father of the baby. Apparently Liv came up with the story that she met a man in a bar while Frank was out of town. Mom was not buying the story, but Liv stuck with it. 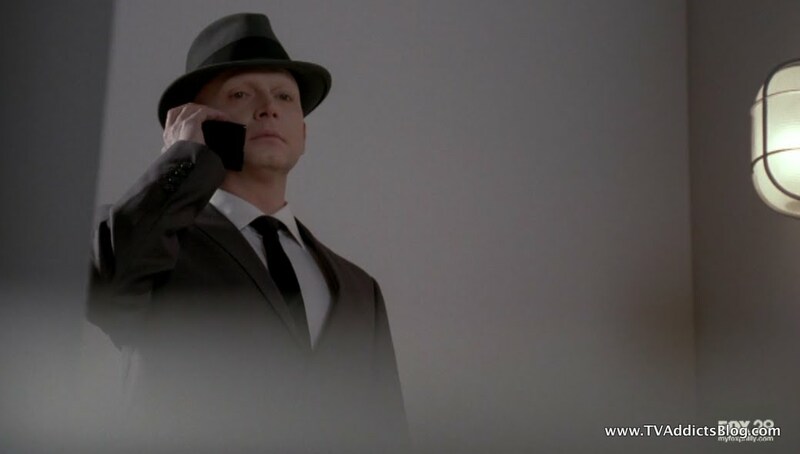 Anyway, when Fauxlivia gets to her apartment, she gets a call from Lincoln who seems very concerned for her. Apparently she is getting the sense that she's being watched. 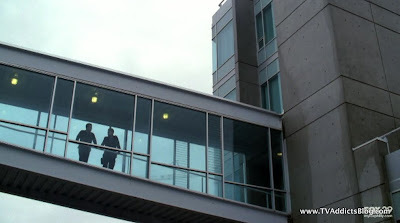 Probably not a bad sensation as we do spot the Observer watching her enter the building. She also thought someone was watching her the day before. But, if the Observer is hanging out, something important seems sure to be going down! She gets into her apartment, and it looks like the last thing she was looking at on her advanced OVER THERE iPad-ish device was around VPE. 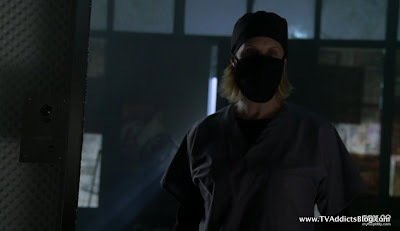 But before she knows it, she gets zapped on the neck with a taser and taken hostage by some crazy doctor/nurse folk! 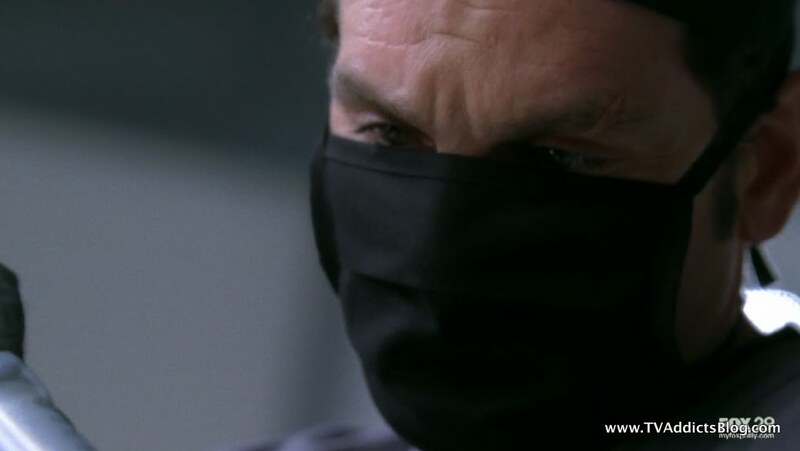 The doctors are all masked for a majority of the episode and we get a look at 2 of them later on. They clearly are interested in doing something about Fauxlivia's unborn child and inject her with some green drug, then give her a drug to knock her out. The woman seemed the most concerned for Fauxlivia and is it me or did she seem awfully familiar? I've probably just seen her in another show and IMDB isn't updated yet with the guest cast. Anyway, she puts some crazy lit bulls eye on her belly and left the room. The light must be some advanced ultrasound. Some time passes and the doctors are talking about giving her a stronger dose of medication to knock her out. The woman begs the man to reconsider but he seems to have some kind of authority and she backs down. We find out that the unborn child is indeed a boy and that he is doing just fine. 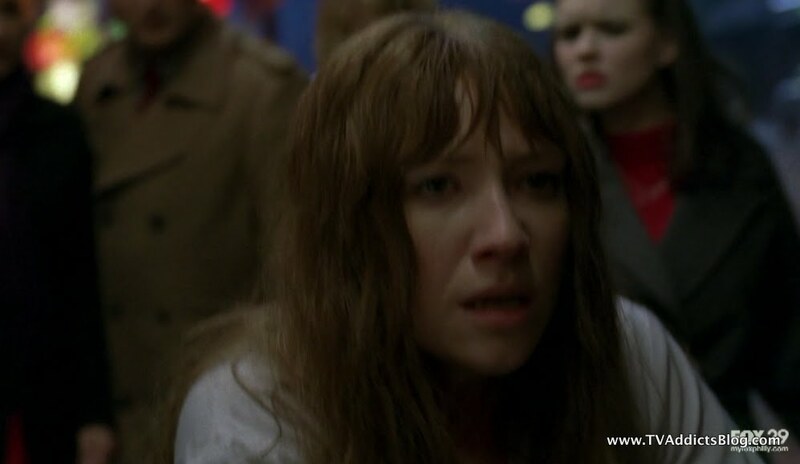 Fauxlivia refuses to take the next round of sedatives and the woman insists it's for her own good. So, she does pretend to take it but then spits it out when the woman leaves. Meanwhile, Fauxlivia's mother gets a call from Rosa (the doctor from the beginning of the episode), she can't seem to get a hold of Liv but informs Mom that indeed she is a carrier for VPE. So things are not looking very good at all for her. Liv, still being held hostage, pretends to be unconscious until the woman leaves and then tries to grab a tool to pry herself loose from the bindings. And just as she's about to make some progress, she starts having some crazy convulsions and drops the scalpel. The woman indicates to the doctor that they are ready. And then we see it, Fauxlivia's child is growing in that belly of hers. WHAAAAT!?!?! 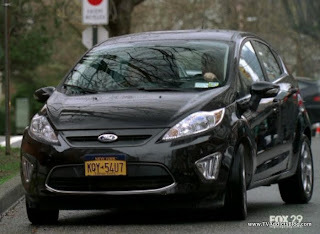 In later scenes we see that Fauxlivia's child is definitely growing in her. The doctors start talking all doctor talk but seem to be doing everything in Fauxlivia's or at least the child's best interest. What their intentions are are still unknown. 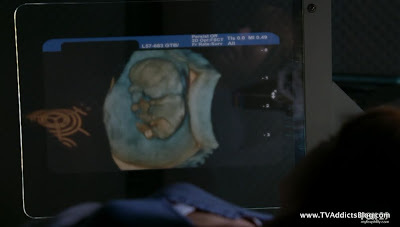 But they are doing everything meticulously and making sure Fauxlivia remains healthy while this baby grows. The male doctor leader guy wants another sedative given to her and the woman is arguing that she should not be administered another one. 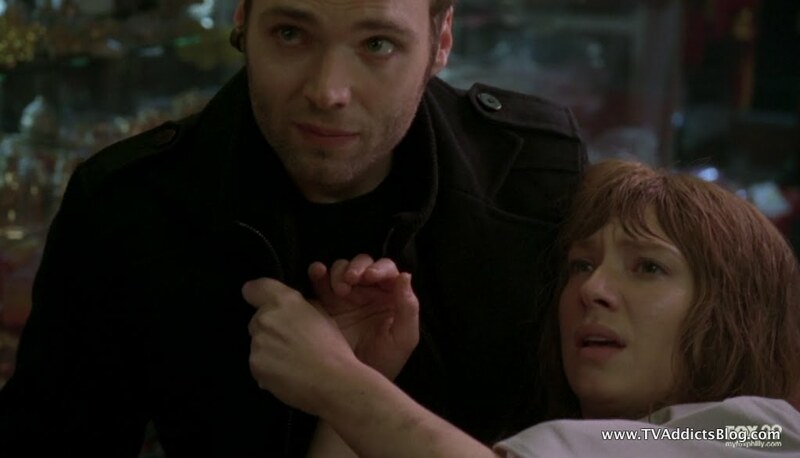 Actually, it seems the nurse is concerned for Fauxlivia's life while the man only may care about the child. He said they have a timetable and they must stick to it. Whose timetable? Well, we'll find out soon enough. Later, Fauxlivia is awake and the woman doctor is requesting her to empty her bladder. Liv is not feeling too good. She starts making a plea to the nurse to save her. She tells her that she most likely has VPE and brings up her sister. She has been awake and knows that the woman has been objecting to the all of the drugging they are doing to her. She begs for the nurse to help her before it is too late and she and the baby die. Fauxlivia just wants to be left alone for a few minutes and she'd take care of the rest. But Nurse woman is only concerned about bladders being empty! Next phase in 22 minutes! 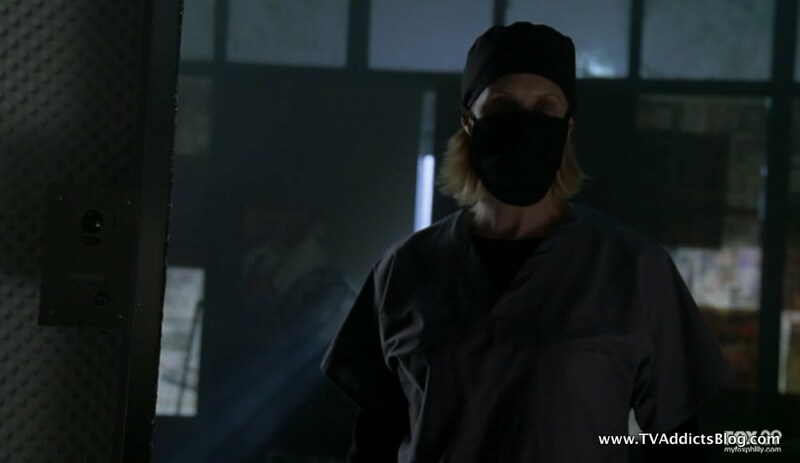 When Fauxlivia is walked back to the treatment room, she sees that scalpel she had dropped earlier. 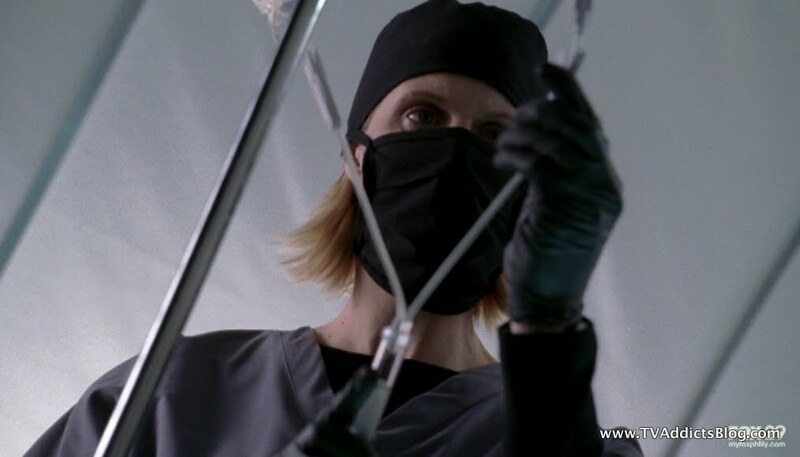 She makes a quick decision to whack the nurse in the stomach, grab the scalpel and then force her to help her escape! Yeaaaah! 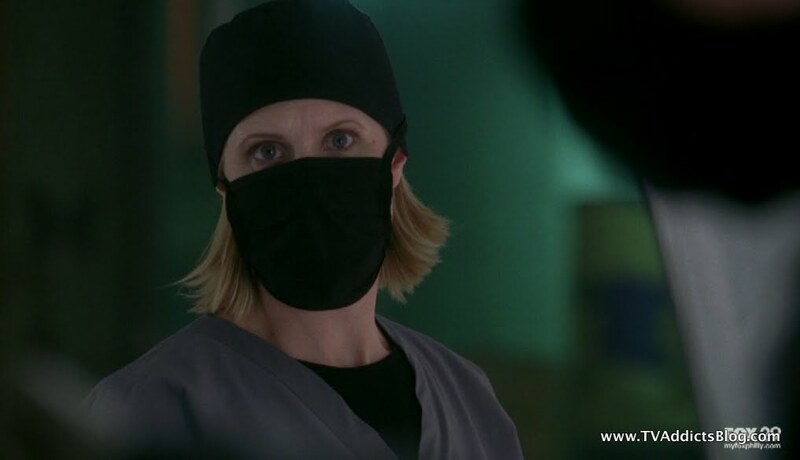 Who thought we'd be rooting for Alternate Olivia to escape the clutches of these mysterious masked medical folks!? She takes a few shots at the docs standing in her way and keeps walking towards the exit with Nurse in tow. The woman has no choice but to enter the code and let her walk. The woman sounds the alarm and crazy eyebrow doctor goes after her stating that she won't get far. 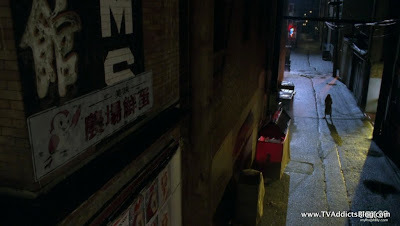 It turns out that Fauxlivia is in the middle of Chinatown in Manhatan (one t intentional as always!). Naturally, there are lots of Americans hanging around in the area. I'm sure they're looking for some knock-off purses and watches and such just like they do over here! 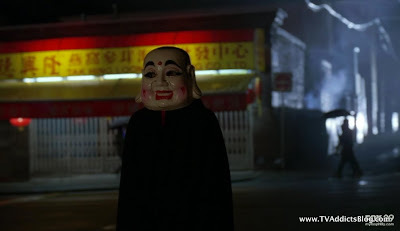 Of course, some people over there apparently like to walk around with weird masks on their face. 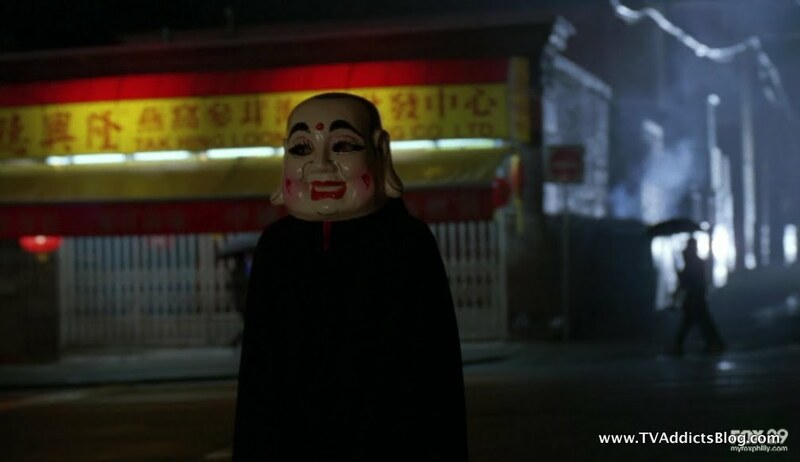 She sees a woman vacuuming in a Chinese Restaurant (well, what did you expect in Chinatown, Italian?) and tries to get her attention. But, she starts getting crazy feelings in the tummy again. She manages to get to a phone booth and call Lincoln. TO BE CONTINUED!!! 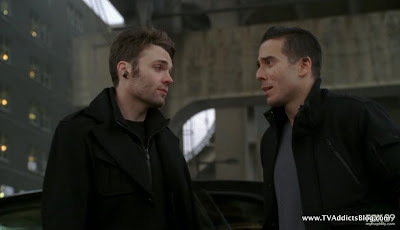 Before they are aware of the abduction, Lincoln and Charlie are shooting the breeze and we find out that Charlie went on a date with the bug girl (Mona) we met in the previous OVER THERE episode. Nice that they made reference to it. He states that at least he is getting himself out there. 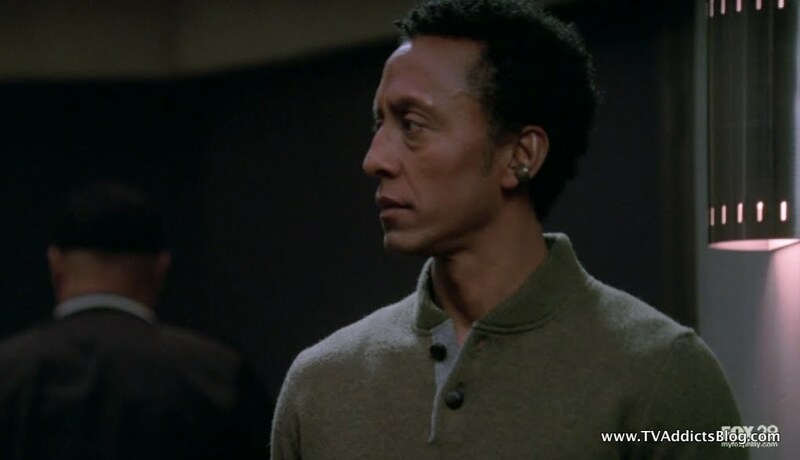 But the big reveal here, and maybe looking back it wasn't that much of a reveal, is that Lincoln seems to have feelings for Fauxlivia. Awwwwww, isn't that sweet? That may explain why he was quick to spill the beans on Frank's proposal in the last episode. Maybe he hoped by warning Fauxlivia ahead of time, she'd bail. 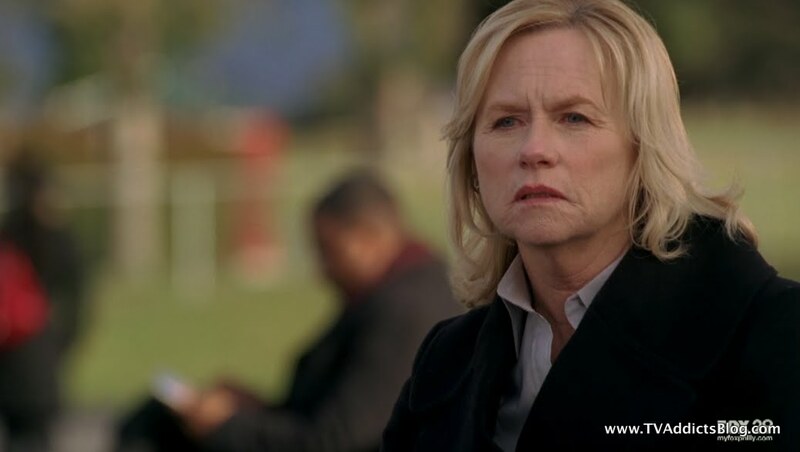 According to Alt-Liv, she told her mother that Lincoln is not very happy about her current situation of being pregnant without the father involved. She needs a support system and it would seem that Lincoln is volunteering for the job. He almost mentioned that he thought if she was going to cheat on Frank with someone, it would have been him, but he cut himself off. Little do they know that they are about to unveil a whole conspiracy that has been going on right in front of their eyes. The happiness did not last long. 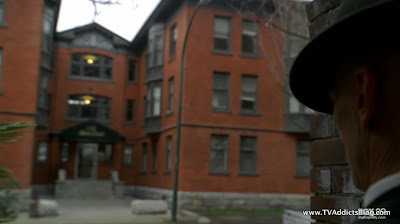 The security detail that Lincoln sent to Fauxlive's apartment figured out that there was a struggle and an abduction. 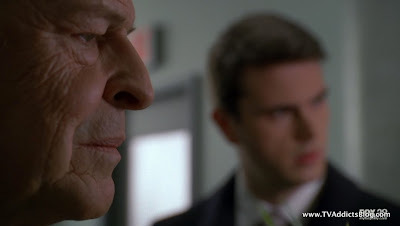 Lincoln informs Walternate of the abduction who gives the impression of being concerned. Clearly, he would have a vested interest since his unborn grandchild is growing in Liv. Of course, he is also concerned with being able to safely cross worlds. And Brandon is urging him to reconsider experimenting on children. Peter is uniquely charged to power the machine. It seems they need to get Peter back on this side before he powers the machine on OUR side. One has to wonder if this grandchild of his may be charged in a similar way. But I'm getting ahead of myself. 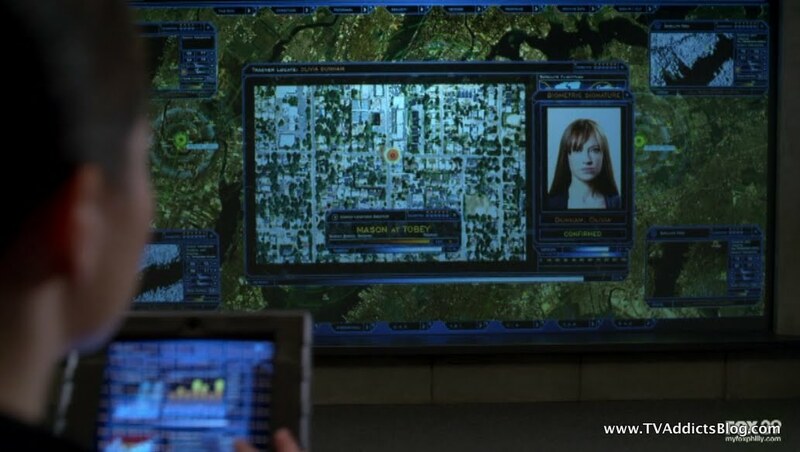 Fauxlivia has a tracker in her so the Fringe Division is hot on her trail. But the abductors seemed to have been tipped off about the tracker and were able to disable it. The trackers are organic in distinct in each individual. 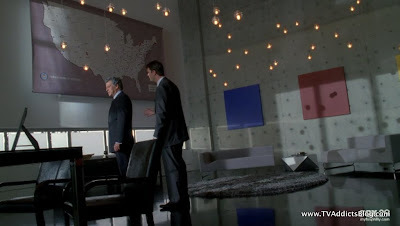 Lincoln speculates an inside job or someone sold the information on how to identify the tracker in Fauxlivia. 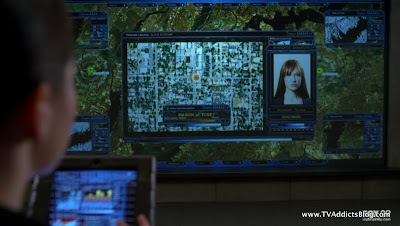 He puts Kick-Astrid on the job of figuring out who has the authority to know about their tracking systems. In the meantime Astrid has found some useful information. 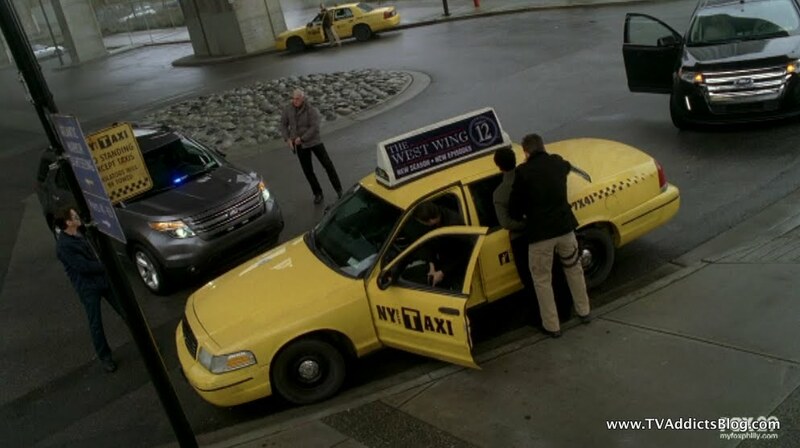 She did her statistical tracking and found out that a certain "commercial vehicle" (aka Taxi) has circled Fauxlivia's apartment at least 6 times in the past week. The statistics prove that this is an anomaly and highly improbable unless intentional. 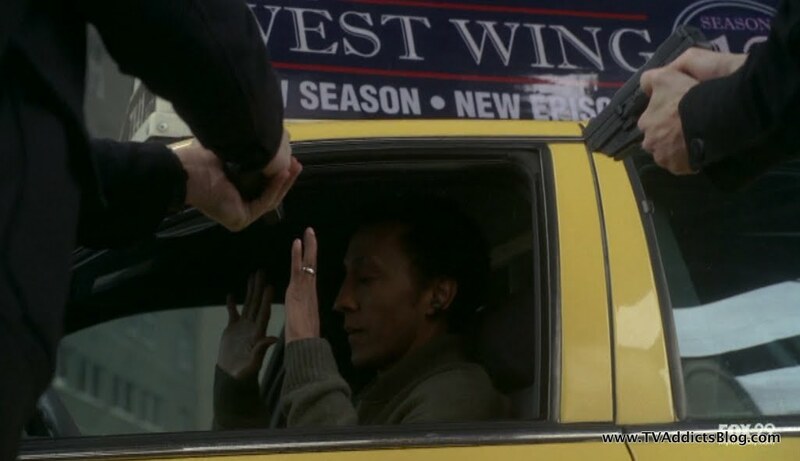 Hmmm, a Taxi Driver that knows a version of Olivia? Who could it be!? Lincoln and Charlie are going to track him down! Shocker, it's HENRY Higgins! Outside of some comical pleasantries exchanged (Hands on the wheel, get out of the car! "Which one is it??" Good times), Henry starts to spill what he knows about Olivia Dunham. They recognize that he's the cab driver from the gas station. He explains that Olivia threatened Henry so he helped her escape. But he was also worried about her so he drives around to check on her every once in awhile. He really didn't even expect to see her again after he got her to Liberty Island but he ran into her (Fauxlivia) a few weeks ago on the street and she didn't even recognize him. He told them that Olivia insisted that people were trying to convince her that she was someone she was not. She wanted to go home to some guy named Peter. Hmmmm the wheels are starting to turn in Lincoln and Charlie's heads! Then Henry said the magic word. He understood there may be things he shouldn't know about but when you start hearing things about some other UNIVERSE, it's hard to ignore. And the lights go on! Lincoln starts to talk to Charlie about a conversation they had earlier this season. 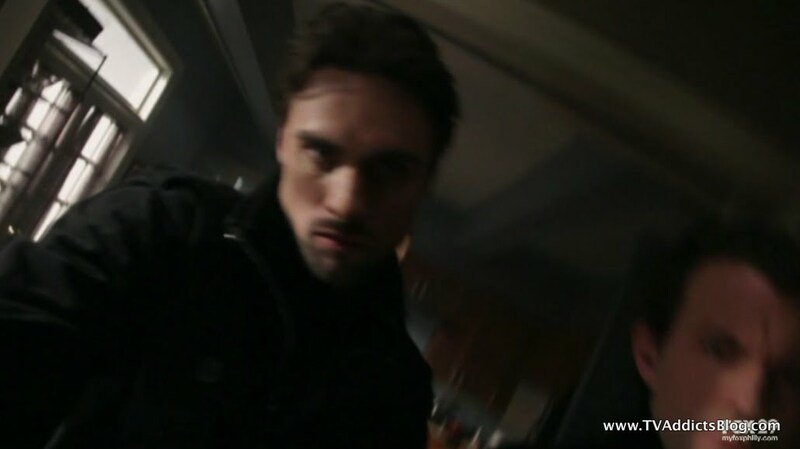 Charlie had asked Linc if he thought it was possible that the 2 Olivias may have been swapped, he's starting to think that Charlie wasn't crazy. 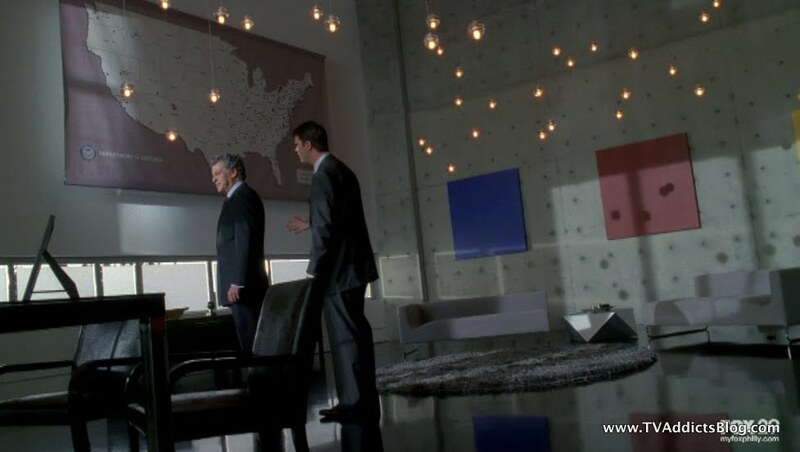 Lincoln takes his concerns straight to the top, to Walternate. He fills Walternate in on Henry and everything they theorized afterwards then flat out demands an answer from Walternate in order to get a lead on finding Fauxlivia. Walternate admits that the Olivias were switched. He then told him even more. 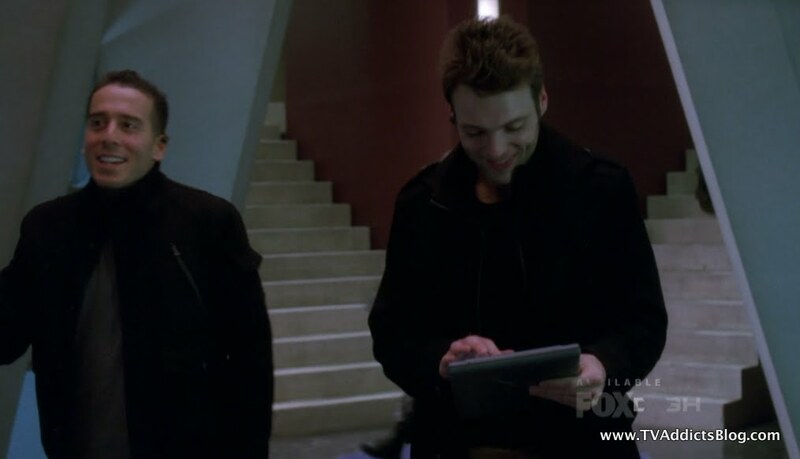 During that time, Fauxlivia infiltrated THEIR (our) Fringe Division. She returned safely weeks ago. Linc asked what happened to OUR Olivia. Walternate lied and said that they sent her home. Hmmm I believe you tried to kill her Walternate and she escaped! Walter then explains that her abduction might be related. He goes one step further and reveals the baby daddy mystery! "Agent Dunham is carrying my grandchild." He explains it wasn't part of the mission but that Faux and Peter got close when she was over there. Lincoln looked pretty shocked and heartbroken by the revelation, but Walternate insists it needed to be explained to help find her. (little did we know at the time but, it was all an act!) He says that only Faux and he are the only ones that are aware of the pregnancy. Walternate suggests it might be invaders from the other universe OR an inside job, but it is imperative that another child is not taken from him. 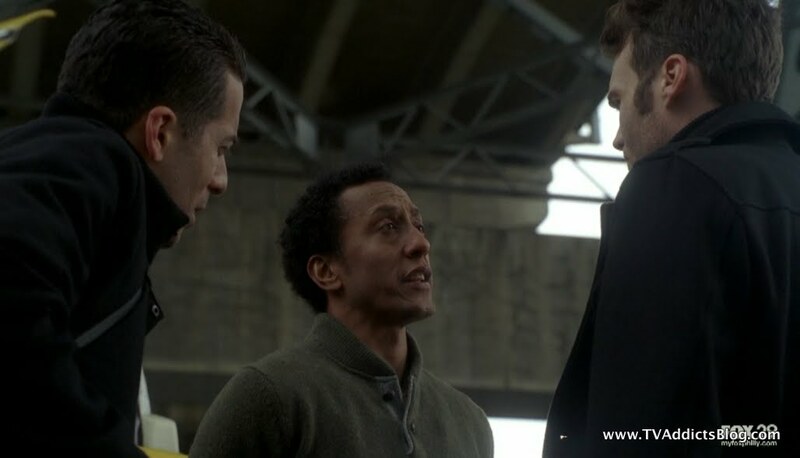 He gives Lincoln full access to Faulivia's mission files and promises to answer all questions. Astrid did her research on who had access to know how to disable a tracker. She said there are too many to narrow down the search and needs another variable. Lincoln says he is going to reveal something with level 10 clearance. Agent Dunham is pregnant with Secretary Bishop's grandchild. She goes with her additional information to see what she can do. 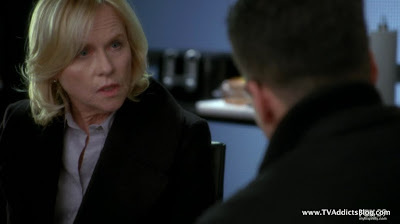 Marilyn (Mama Olivia) shows up at Fringe Division and Charlie said he would get her up to speed that her daughter is missing. During the conversation it comes up that the kidnapping might be related to the pregnancy and Marilyn explains that Fauxlivia is a VPE carrier and she can't have the baby. Uh oh! Things just got intense! 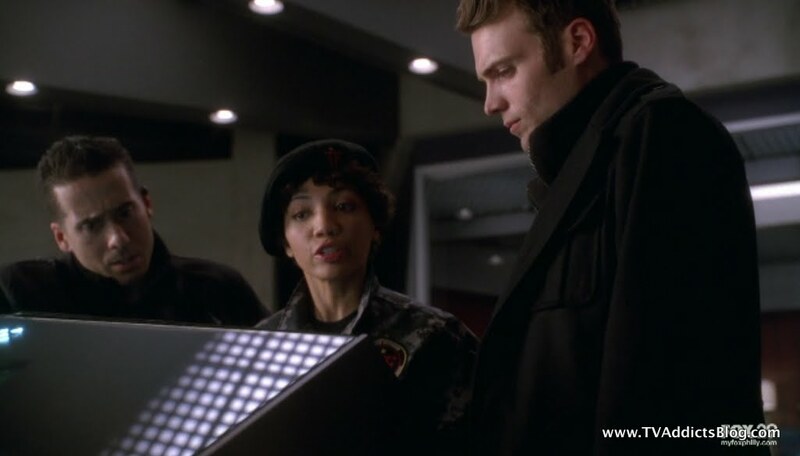 As Lincoln is preparing to get Henry to his cab and informing him of the classified nature of the information he has learned, Fauxlivia's call comes in. She gives some landmarks around her location and says that she thinks the baby is coming which totally catches Lincoln off guard. 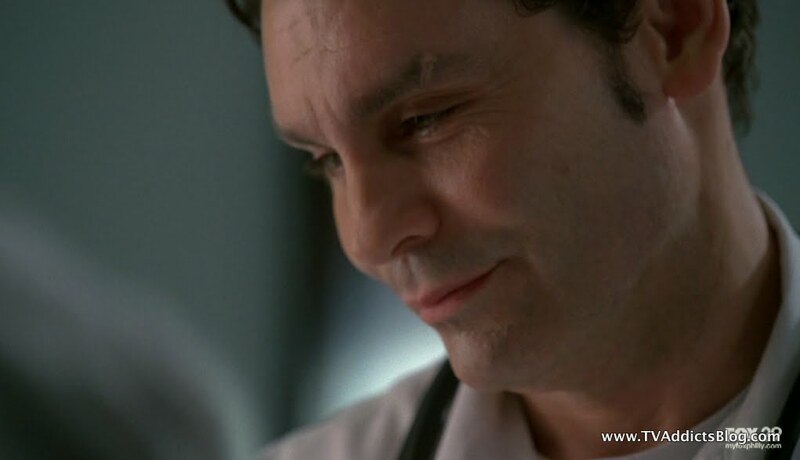 She informs him that the pregnancy was accelerated and that she needs him to speak to her mother (about the VPE). She drops the phone and sees scary doctor guy following her. She runs off, but Lincoln had enough information to track her location. Henry offers his driving services as he knows a shortcut. 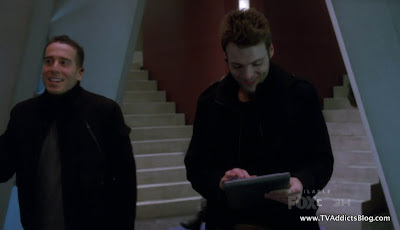 Once Charlie gets the scoop that the pregnancy was accelerated he tells Lincoln about the VPE and that Fauxlivia won't make it through delivery. The crowd that was drawn was able to help deter evil doctor guy from pursuing Fauxlivia any further. When Fringe Division arrived they got to Liv and brought her into a store. Henry introduced himself to the OTHER Olivia and said that he delivered his daughter in the back of a cab. Liv asks Lincoln if he talked to her mother. The knowing glance said it all. What followed was a very emotional scene of Olivia (fine, I'll call her it. She deserves it.) prepared to give birth and end her life but asking that the child is saved. Lincoln holds her tight and says he'll stay until the end. There's no place else for him to be and then he reveals his love for her. 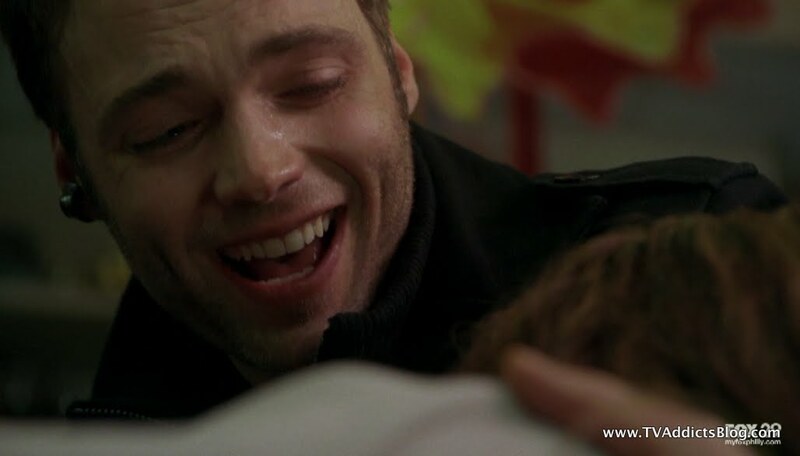 He promises to save the baby acknowledging that this may be the end for her. She pushes one last time and the baby is born and is perfectly healthy. But their Olivia appears unconscious. Don't know about everyone else, but I fell for the bait and assumed that the writers killed her! But then she breathed and woke up and everyone rejoiced!!! It's GLORIOUS!!! Whew...who thought we'd be in a position where we'd be rooting for Fauxlivia to survive? Great stuff. 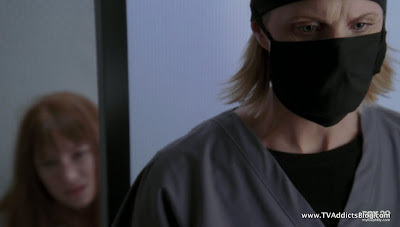 As the ambulance arrives, we get a glimpse of the nurse that treated Fauxlivia, umasked. But she just walks away. 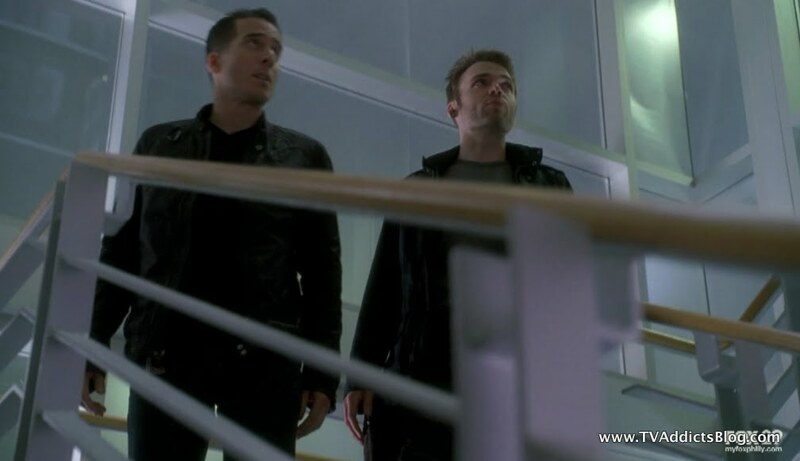 At the Hospital, Charlie and Lincoln are back to their joking ways. Charlie lies about knowing the baby's name and then calls him Sir for the first time. He also said Broyles would be proud. 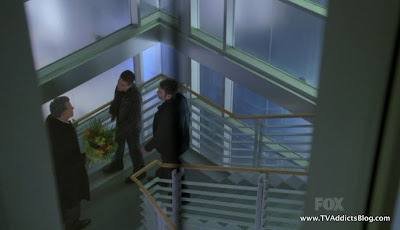 They ran into Walternate in the stairwell and said they are still searching the abandoned warehouse for clues to Liv's abductors. 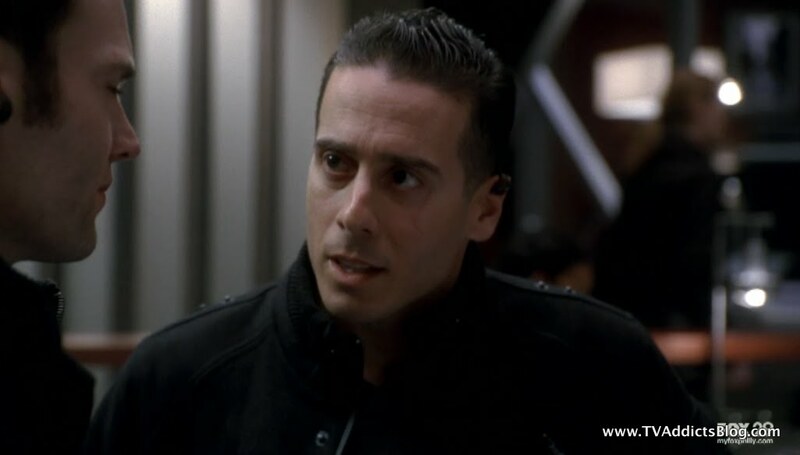 Walternate insists the search continues for the safety of Liv and baby. After Walternate moves on, they discuss how he should have told them that the Olivia's were switched. Lincoln suspects there might be more that they weren't told. They also realized that Olivia returned right around the time Broyles disappeared. 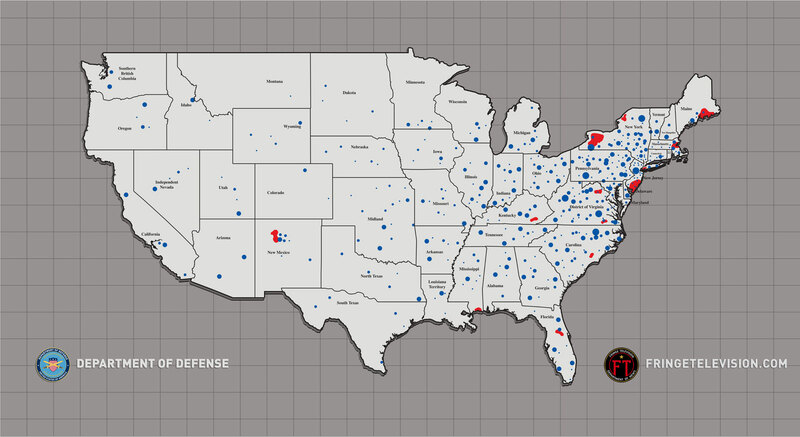 Looks like OUR Fringe Division may have some additional allies over there just as we expected! Fauxlivia, Mom and baby have a moment. We learn that the accelerated growth of the baby is what allowed them both to survive without the VPE virus accelerating with the pregnancy. Fauxlivia states her unpreparedness of being a mother but Marilyn lets her know all she needs to do is love him. The nurses then take a blood sample from the baby who begins to cry. And then the doctor that takes the blood sample away is EVIL EYEBROW DOCTOR GUY!!! The sample is passed on to someone and we get a shot of it. Baby Boy Dunham born on 2/14/2011. (Happy V-Day!) September is on hand to OBSERVE the event and informs his associates "It is Happening." Oh boy!! We then get a moment where Walternate is looking at Fauxlivia from outside of the room and Brandon joins him. 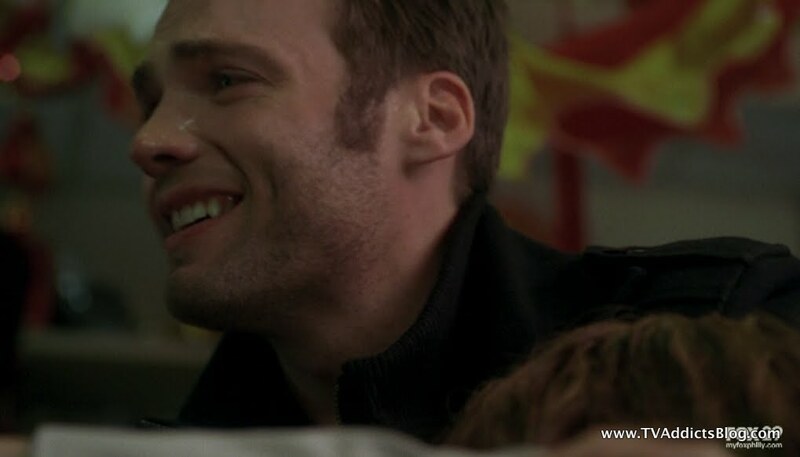 Brandon questioned Walternate telling Linc so much. Walternate responded that he's a good agent and lying would have made him suspicious and he trusted Brandon wouldn't fail. And he didn't. He passed on the blood sample to Walternate. Yup, Walternate was behind the whole accelerated growth!! He wants this baby healthy and for some reason other than it just being his grandchild. At least, that's my suspicion. THINGS ARE ABOUT TO GET EVEN CRAZIER!!!! So, that's the episode, but I need to speculate on a few things before we get to the fun stuff. So Peter is uniquely charged to work the machine. 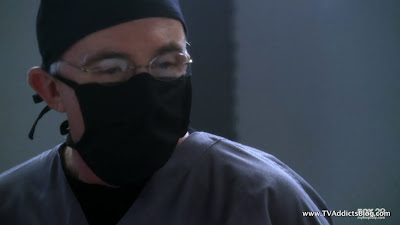 Walternate does not want to experiment on children yet he has no problem advancing the childbirth of his own grandson. Yes, he probably did it to SAVE the child from dying during child birth. 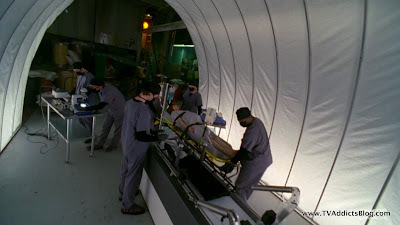 It would seem that since HEAD DOCTOR wasn't too worried about Fauxlivia surviving the process, that Walternate may not care either. The baby is what is important. The son of Peter. So, who is to say that the baby may not be uniquely charged also? (They did after all capture the baby's blood for analysis and the episode's name was called bloodline!) And here's another question. From what we know about season 1's accelerated growth, it didn't stop at child birth. Do we think this child will grow quickly into an adult? It seems like the process has been perfected since we saw it in season 1 in OUR universe. But maybe the child would still grow at and advanced rate. Here's a crazy theory I'll throw out there. What if by the finale, Peter Jr (for lack of an actual name) will be operating the machine in THEIR universe WHILE Peter is operating the machine in OURS? The results of both machines operating simultaneously would be certainly unpredictable and right up Fringe's alley! The observers clearly want all of the events we have seen take place to happen and everything is right on course. 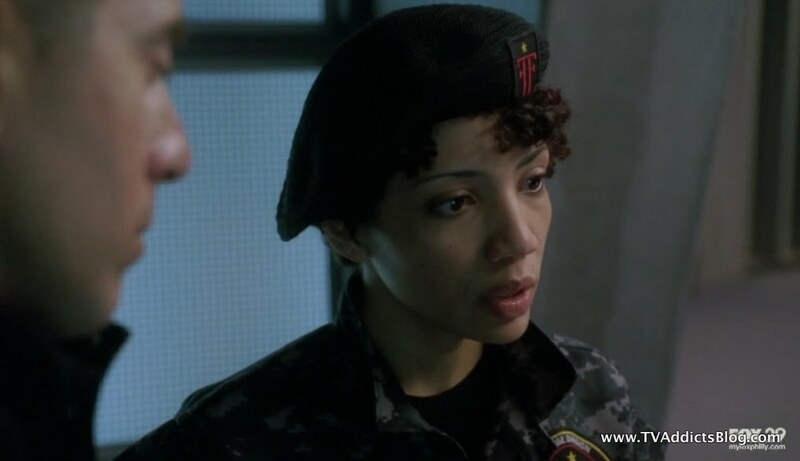 Glyph Code of the Week - FATED - Well, maybe it was Fauxlivia's fate to survive that pregnancy, for the child to be born early. Perhaps it is referring to William Bell's comments last week about being a scientist who believes in destiny. And with the observers overseeing events making sure they go according to plan, the term is very applicable to FRINGE. Observer Spotted! 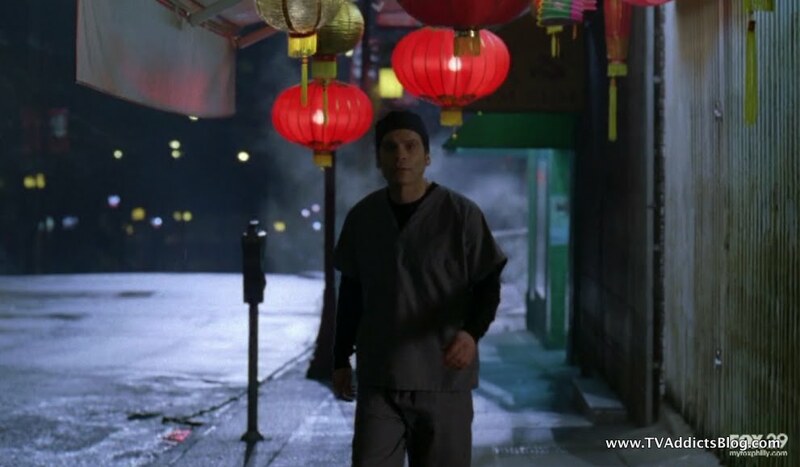 - This was an easy one as September was actually featured in the episode. They do show another shot early on in the episode when Fauxlivia was dropped off at her apartment. Of course, that wasn't really hidden either! Did you know The West Wing never went off the air in the Alt-verse? It would appear they are entering season 12 and like to advertise that fact! In case anyone was concerned, Ford does still manufacture cars over there! 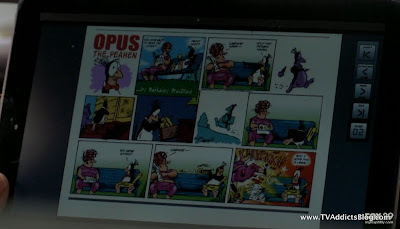 Opus The Peahen is apparently a comic OVER HERE too, but the author (Berk Breathed) quit making it a few years ago. Over there, it's still available on an advanced iPad comic book app near you! There are 4 episodes left this season. The final 3 episodes, according to the producers, all act as one story arc, so it's pretty much a 3 part season finale. We have a 3 week hiatus before these episodes start to air (2 straight Fridays without new eps). 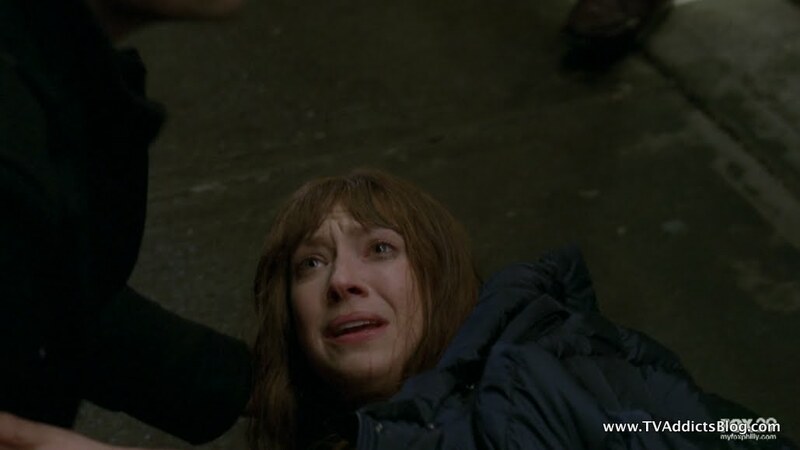 If that schedule held up with no more reruns, that would mean the Fringe Finale would be May 6th, but I thought I had read that it will be the 20th. Stay tuned on that. But, I will warn you all that the weekend of May 13-15 I will be traveling, so blogging will be difficult unfortunately. 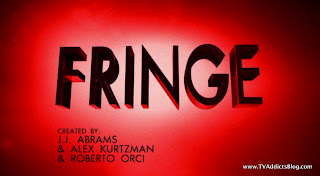 If it's the Fringe finale that airs though, I will be sure to write up SOMETHING eventually. So, I apologize in advance! For now that's all I have! Make sure you check the END CREDITS below to see some current and potential future blogging adventures! Hope you enjoyed my ramblings and I'll see you in a couple weeks for the next FRINGE! I know it's sometimes looked at as a blemish on my beautiful blogging record, but I am still watching American Idol. I have recently come out of retirement to do some quick recaps on the LIVE shows. Just can't resist. Come check it out if you dare! Mike, thanks for your efforts. 1. You may recall that I suggested a few eps ago that the baby will accelerated (kind of like Dune). And if the parallel holds, the baby will keep aging at an advanced rate. 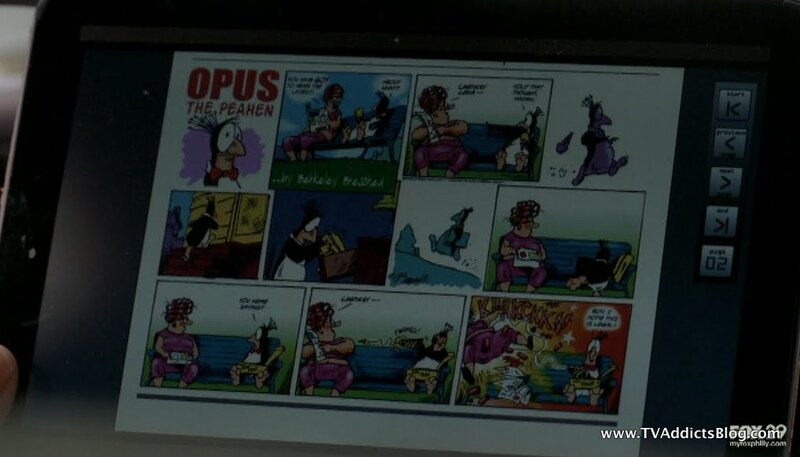 Also, I suspected a few eps ago, that Walternate might be willing to put the serum into his grandchild vs other children. 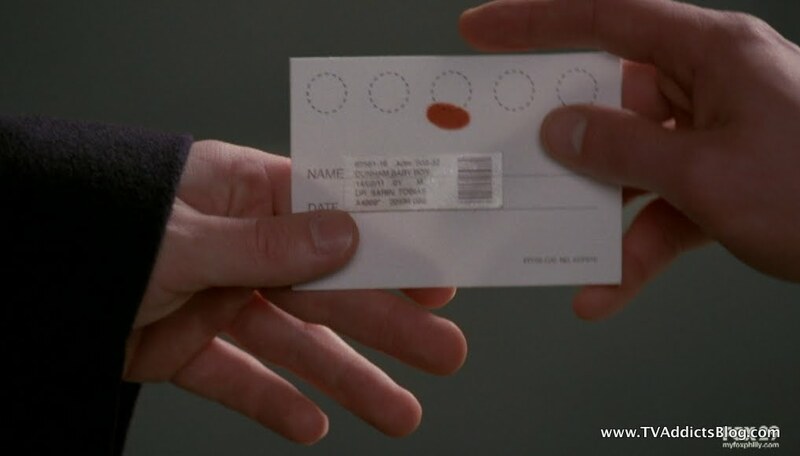 On the other hand, this blood test will tell him if the characteristics are already there. 2. 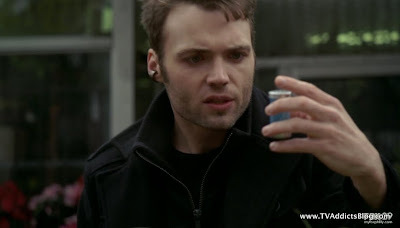 I think the green serum was done to avoid the possibility of the boy dieing from VPE. 3. I was very happy to see an observer actually do something over there. It seemed he was happy about the boy. At one point I thought they might actually have been behind the abduction. 4. I am surprised that Lee and the others don't know about the alt Broyles. 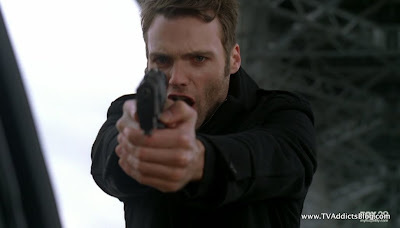 What alt Broyles did was help the enemy. 5. I thought they said 3 weeks before the next new eps? 2 would be better. 3 vs 4 more eps this season--seems lilke they weren't sure if they would be picked up for next year. My guess is that with the push back on broadcast and 3 vs 4 more, they're doing a different season finale now that there is a next year. 6. I thought this was one of the best eps. 7. If this were to become an 8 season show, that makes this machine stuff a little less important vs what appears to be a climatic point at this time. Of course, they could just push back the machine activation timetable. 8. We got lots of answers this ep and of course some new questions. 1.) Yes, I remember you comparing to Dune and I remember us all discussing the possibility that they may age the baby at a progressive rate. 2.) Agreed. Seemed pretty clear by the end that Walternate wants that baby healthy! 3.) I did think the Observers were involved with the abduction at first too. Crazy stuff. 4.) 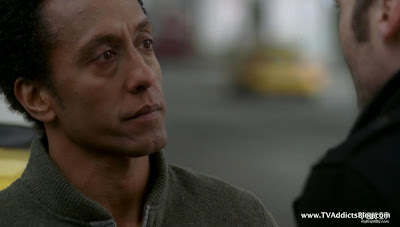 I think Lincoln and Charlie were piecing the Broyles thing together at the end of the episode. I think they would certainly side with Broyles over Walternate. Especially if they found out Walternate had Broyles killed for helping the "enemy" (as you call our heroes). It really seems like everything is pointing towards our Red World Fringe folks helping out our Blue world Fringe Folks, but we'll see. 5.) They did say 3 weeks, but that means 2 Fridays with no new episodes. I guess my "2 week hiatus" is misleading lol I'll fix it. Thanks! 6.) agreed, it was fantastic! 7.) I agree, this could just be the small stepping stone to some bigger things they have planned. We just keep peeling back the onion to see how many layers deep this story actually goes. I think the machine will be a very big part of this year's finale and I think it's a certainty it will be activated. 8.) Yep, just like any good serialized television show will do. Always make you wonder what's coming next! Does anyone think it possible that ultimately the two worlds could become one? Yeah I've thrown that idea out there as well. Not sure how it would work but it certainly would be interesting! In LOST we had overarching questions, such as, are they dead, where are they, what about the smoke monster, will love save them? The first 2 to me, being the critical ones. What are those types of questions for Fringe? Oh and anyone who still thinks that the LOSTIES were dead the whole time, I direct you to watch the scene between Jack and Christian Shephard in the final 10 minutes of the series finale. There would be no point in anyone telling lies at THAT moment of the show. 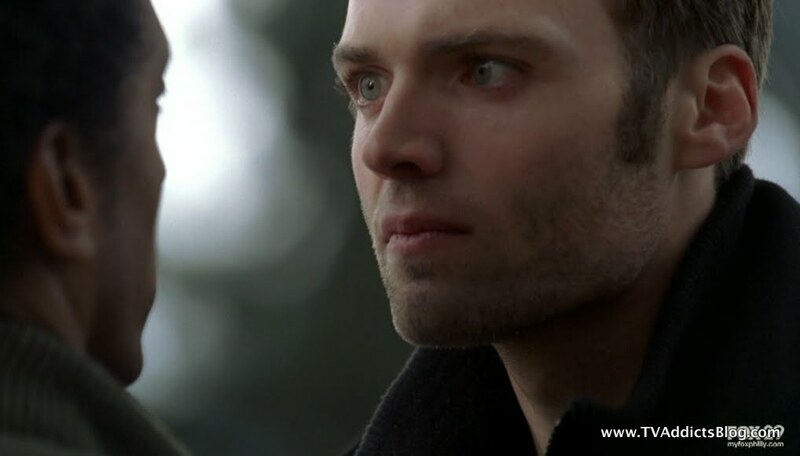 Jack: Are you real? Christian: I sure hope so. I'm real, you're real, everything that ever happened to you was real. Jack: They're all dead too? Christian: Everyone dies some time kiddo. Some before you, some long after you. etc.....(paraphrasing the whole conversation but having watched it so many times, I remember a lot of it verbatim!) Yes they didn't flat out say that they were alive on the island, but it's strongly implied. Who/What are the First People? Where do the Observers come from and what is their relation to the First People? Were there always 2 (or more) universes or did these DOOMSDAY Devices create them? What makes Peter so special? Why is he uniquely charged to operate the device? Not sure if Nina Sharp is still a mystery. I just feel like they retooled her character from the first season. That first season her actions were shrouded in mystery but now her goals seem to be aligned with the Fringe team's goals and she's a very powerful ally. But, you never know when they may throw a twist in there. Of course there is THIS season's question of what will happen when these device(s) are activated. Destruction/Creation/Unknown Option C.
But I don't feel there is one big overarching question like WHERE ARE THEY or WHAT IS THE ISLAND. Just some major plot points that will be revealed in time. My opinion anyway :) I'm sure others have different questions they would like resolved so let's have at it! Overall the episode was excellent, though when they deal with pregnancy and the complications of it I always get a bit skeeved out..
@AUSW - Thank you! I was actually happy I caught on to the connection. I didn't realize it as I was watching but was able to tie it up afterwards. I guess we should note that while the bugs in charlie is similar to Charlie in our universe it was some kind of worms or maggots in him instead. Hopefully, they'll keep trying to link stuff up. It makes season 1 feel more important in the scheme of things, even though we know they retooled the show in the middle of season 2 based on what was working best. The episode definitely had its skeevy moments! But, then again, a lot of Fringe has those moments! 1. As far as LOST, the question of them being dead was answered, until the question was reopened in season 6--IMHO making it an overarching question--I could be reaching with that one though. 2.Thank YOU and I loved your thoughtful reply on Fringe and there may be a few are more. Which makes considering story lines against those questions more interesting in the show/blog--again, IMHO. 3. I think your first 3 probably won't be answered this year especially now that there's another season. And in some ways are more of the underlying mystery--at least to me. I would also like to add a question--are we sure what we believe to be "our world" is indeed as we know it? Meaning, is there a mystery that somehow makes "our world" different. 5.I believe Nina is a question mark on several fronts. 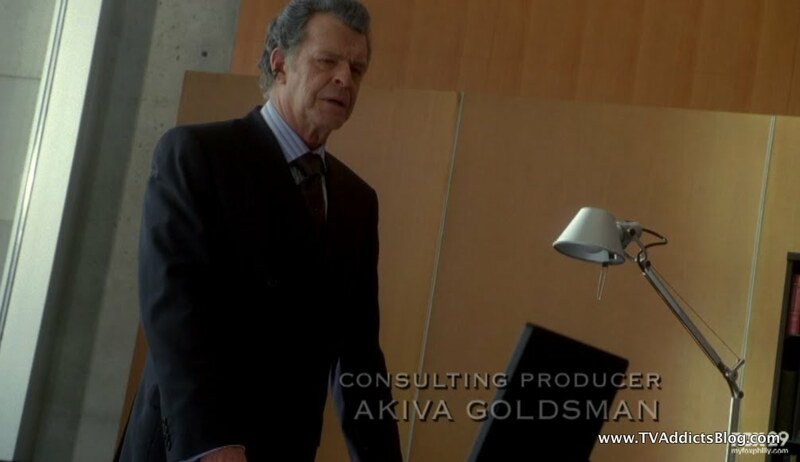 For example, that she seems to know a lot about Sam Weiss makes me wonder about her background. When and why did she get to know him? 6. 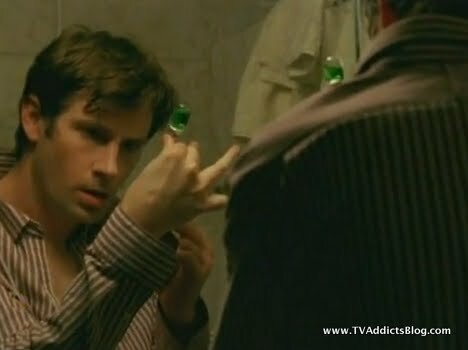 I expect that Peter's son as does Peter, have some of that serum in him that Walternate developed(allowed him to live). 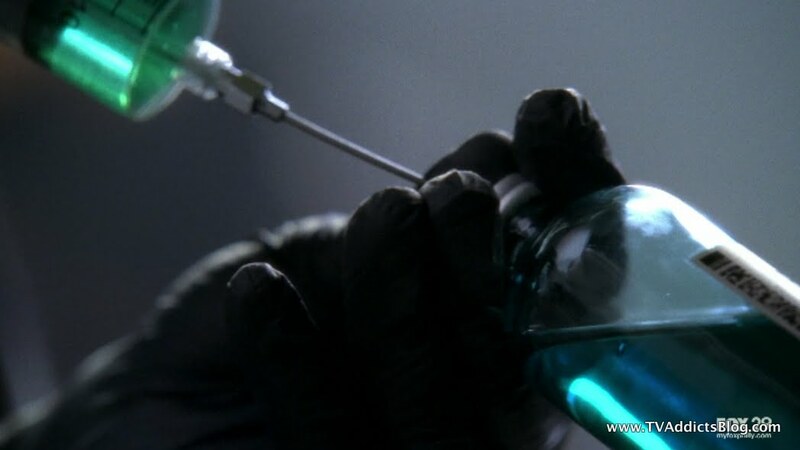 Which if the serum Walter gave Olivia makes her special, the Walternate serum may make Peter special. Could it be the same, it seems I should know that one?? For #1, I get where you're coming from but I think I still disagree based on my previous comments. 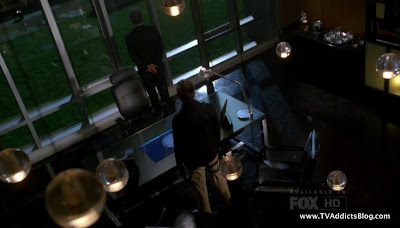 It was a question for Sideways but as for the whole show that happened from season 1-6 that was NOT sideways, we were intentionally steered away from this question by the producers so we didn't harp on it. All of your Fringe comments make sense and definitely worth keeping in the back of our minds as we go forward! I'll try to comment more later but gotta run for now! Another great ep ! Very excited that we get another season. 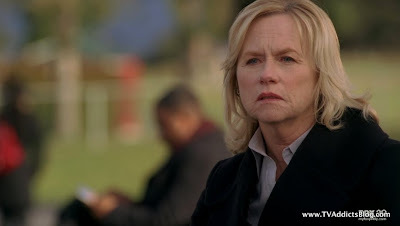 Any plans on watching the new show on AMC The Killing ? I am. After 2 great shows from this net (Walking Dead, Breaking Bad) I'm gonna give it a shot. I wasn't all that big on Rubicon or Mad Men. MJ - I'm definitely interested in checking out THE KILLING. Personally, I don't think AMC has churned out a bad one yet, so I definitely will set the TiVo. But, not sure if I'll have time to recap it or anything like that. We'll play it by ear! Definitely will be checking out Game of Thrones too even though I haven't read the books. Again, not sure about recapping. If I'm able to stay on top of them in real time, maybe I'll at least throw up a discussion blog for them. We'll see! Yeah - will watch Game of Thrones (and not read the books) and probably check out Camelot too. I'm always a day behind though ;-) Haven't watched Shameless finale yet - heard it was great. I saw the Fringe vid, what i found most interesting was the snow globes. That's all I'll say so not to spoil for those who don't want to watch. I think I've seen that snowglobe scene so many times in other previews I thought it already happened on the show. Maybe it did??? lol I'm sure I would have remembered discussing it. But yes, very interesting and seems to go along with some things that have been discussed on the blog or in the comments previously. We'll see! Shameless was fantastic. Won't say anything more until you see. I got tempted by a column on EW yesterday for the Game of Thrones Book Club (people trying to read and catch up for the premiere). I bought the book yesterday. Not saying I'll actually finish by 4/17 but I can give it a shot! lol Read the prologue so far and thought it was pretty good. we'll see! Trying to get into a Fringe frame of mind for tonight and trying to recall the similarities what we have found from season one. But wasn't there a third one ?? 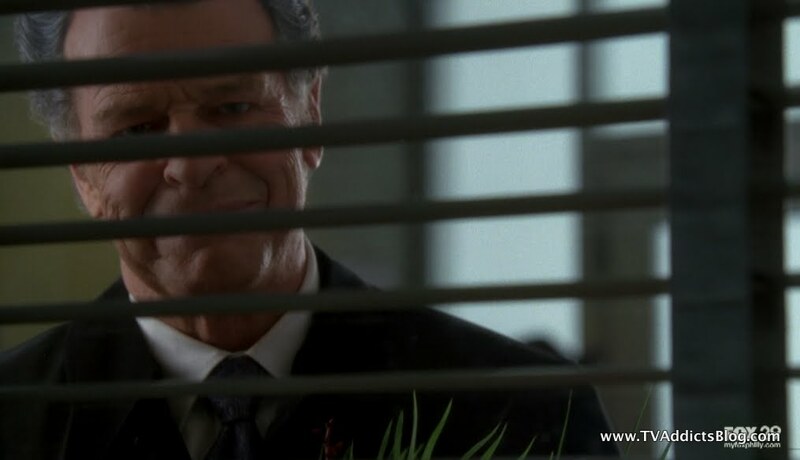 "Finally to a point in my rewatch where I can say that the show really hasn't strayed from its basic principals that were out there in season 1. It all ties in very nicely with what's going on in season 3. The pattern, ZFT all tied to a bigger event all seemed to be tied to Jones who was prepping for a war against the other side. And who inspired him to be prepping? 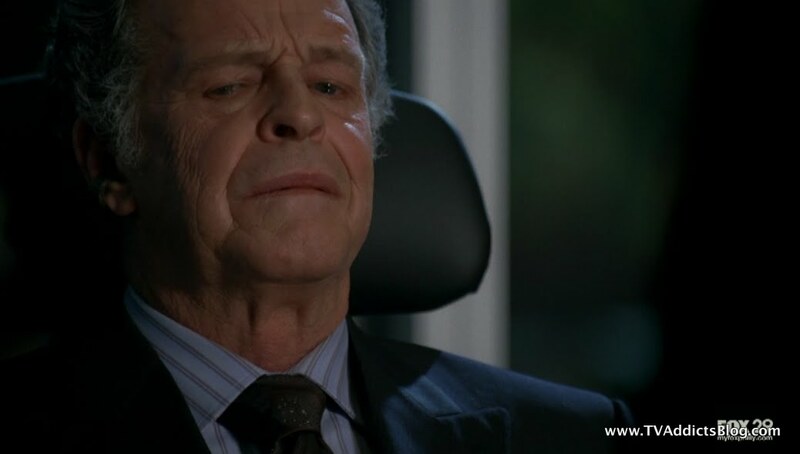 Yep, Dr. Walter Bishop. Season 1 actually holds up pretty well and I'm thoroughly enjoying it. Dare I say it? They actually might have planned a lot of this in advance! lol I'm looking forward to getting through season 1 and marching right on through season 2. And by the quickness I get through this, you'll be able to judge how well my new morning workout routine is going!" 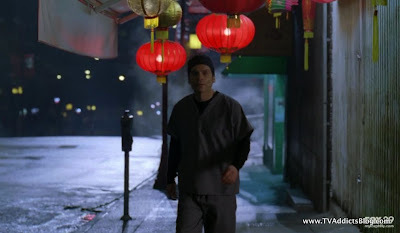 5 days working out, 5 episodes lol I'm on the last disc of season 1 and I just watched the episode this morning where Nick Lane connected with Olivia through her dreams. Lots of reveals about Jacksonville, and Walter experimenting on both Nick and Olivia....which we saw first hand in this year's flashback episode. I can't think of anything more specific like the amber or the baby though. Unless you want to count the WORMS vs. BUGS in Charlie's blood. But I have to say, this rewatch is going much better than expected. Anyway, gotta run off to a meeting but i'm excited for tonight! Thanks. I did read your post originally but could not find it again - but didn't think to check the Event blog! I was in such a rush that I didn't separate my quote from the original post with my new commentary above. I'm sure you saw it though. Pretty psyched for Game of Thrones this wknd btw. I started reading the book. I'm 1/3rd of the way through. If the show is anything like the book (which I've heard it is) we're in for a treat. The Killing is awesome too. Been watching that. I tried Camelot...it's bad, I'm out. Borgias, I did not check out. Not sure I'll have time to either. 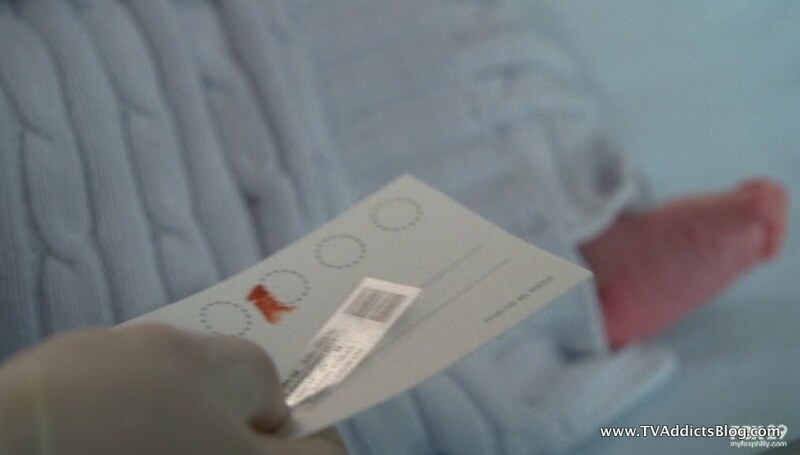 The blood sample given to scarbrow is different to the one given to Walternate.